All you want is a burrito and you want it now. Wait, stop for a moment and imagine that maybe it is really a veggie burrito bowl that your cravings are after. Your tongue is fixated on the roasted peppers and zucchini and your mind is expecting the wrapper… only that element is unnecessary, not to mention impractical, when you remove most grains from your life. In search of new solutions, and cooking in a more unique way, cauliflower rice was born. And yes, you can make a tortilla from cauliflower, just in case you were wondering. Today, however, we are just going to enjoy our burrito in a bowl. A vegetable burrito bowl is a wonderful meal for those times when you are catering to your beloved vegetarian and vegan friends – just remember to use vegetable stock instead of chicken stock in the cauliflower rice. It’s also a beautiful reminder that meat-free meals can be just as amazingly delicious, and it might even come in handy after you have just binge-eaten too much bacon. The meal is light, refreshing, full of lemon and crushed garlic, what’s not to love? Perhaps the best part is that it suits either breakfast, lunch or dinner, definitely no wrong time of day to eat it. If you happen to be serving this burrito bowl on a hot summer day, why not add a lovely appetizer of tomato and cucumber gazpacho to complement the dish? Place the bell peppers, zucchini and mushroom on a baking sheet, but keep them divided. Drizzle with olive oil. Season the mushrooms and zucchini with dried oregano, lemon juice, salt and pepper. Season the peppers with smoked paprika, red pepper flakes, salt and pepper. Coat the vegetables with the seasoning, still keeping them divided; place in the oven. Roast for 25 minutes or until the vegetables are done to your liking. For the cauliflower rice, fry the onion and garlic in coconut oil until soft and translucent. Add the riced cauliflower and fry for a minute before adding a few tablespoons of the chicken stock. Allow the stock to be absorbd, then add more, and allow to cook until cauliflower is softened to your liking. 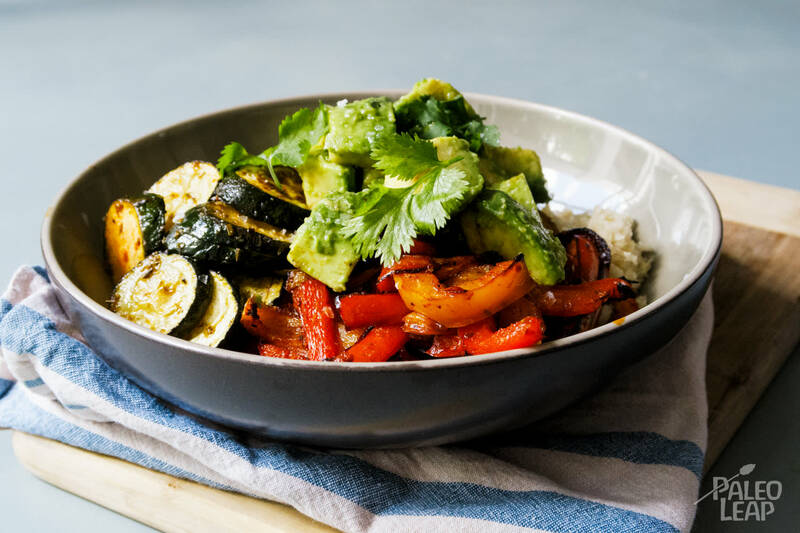 Serve the roasted vegetables on top of the cauliflower rice, top it with cubed avocado and fresh cilantro.